The EA metamodel is one of the most misunderstood EA tools, and the TOGAF documentation doesn’t always do the best job at convincing students of its value or usefulness! What is the issue, and what is the point of an EA metamodel? 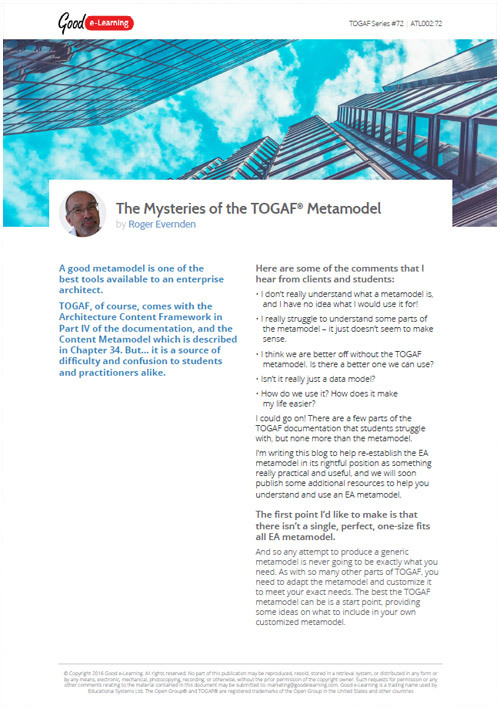 This TOGAF article by Good e-Learning’s enterprise architecture expert Roger Everden answers some of the common questions about the metamodel, and lists five great reasons for having a good one! Download this TOGAF article today and you’ll also get instant access to our entire library of 500+ free Business & IT learning resources!